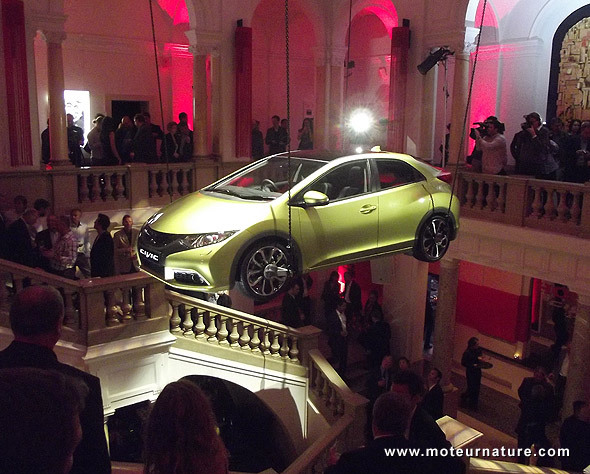 On the eve of the Frankfurt show, Honda had organized an exclusive event where it unveiled the new Honda Civic to a selected few. This was about the European Civic, which is very different from the American model. It’s a 5-door hatchback, which most often sells with a diesel engine in France and several other European countries. The previous generation (still available today) was very innovative when it launched, that was in Frankfurt precisely 6 years ago. We were hopeful for the new generation, but we couldn’t find it at Honda’s event on Monday evening. We quickly went through every hall in the hotel where the event was, without seeing a single car. Had we miss something? Oh! The car’s just above my head! 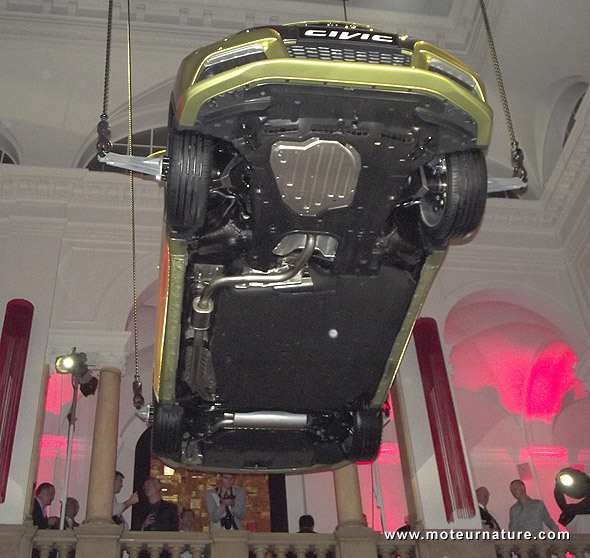 The new Civic was attached to the ceiling, giving an excellent view of its fully covered underfloor. Cd value should be very low. The car isn’t as much a breakthrough as the 2006 model, it’s more an evolution, but everything’s new. There’s a new chassis with better road dynamics, and we appreciated the following day, at the motorshow, to discover that the rear seats fold cleverly to make a flat floor. 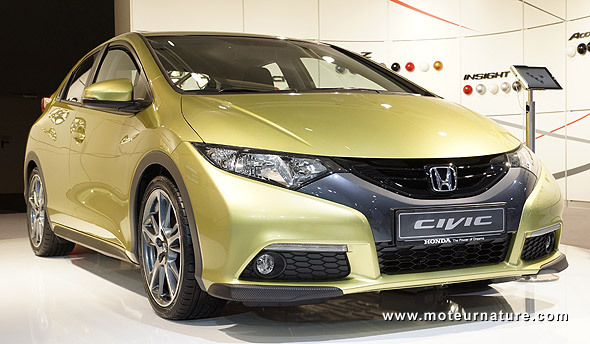 Few manufacturers do it as smartly as Honda does. With a 150-hp diesel, this Civic should get a 55-mpg rating (combined). No doubt, it will convince many drivers in Europe.